Paperback, 8.5 x 7.25 in. / 496 pgs / 500 color. What’s hot and what will be hot in contemporary art in Italy. 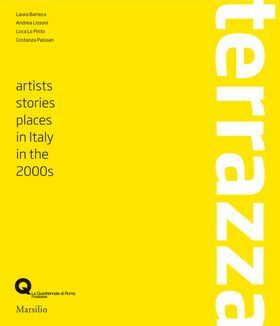 This book explores various aspects of art in Italy from 2000 through 2010: production centers, benchmark exhibitions, the major artistic developments that often contributed to extending if not shifting the domains of art, and the leading Italian artists in recent generations. The story is mainly told through images. In the first part of the book, they describe the more vital energies in artistic culture in Italy. The second part is devoted instead to the analysis of the work of sixty artists who have emerged during the last ten years or have in some way shaped and informed the development of art through their work. The Quadriennale di Roma has selected some of the most brilliant young curators in Italy as contributors: Laura Barreca, Andrea Lissoni, Luca Lo Pinto, and Costanza Paissan. The choice reflects a vision that starts from the phenomena that affected the production of art in Italy in recent years, and then moves on to the individual artists. FORMAT: Pbk, 8.5 x 7.25 in. / 496 pgs / 500 color.